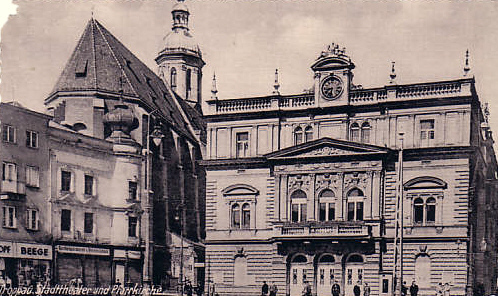 Built 1882-1883 as "Stadttheater" for the city of Troppau by Eduard Labitzky with Hubert Kmentt and Josef Kmentt, as a major reconstruction of the former theatre (built 1804-1805). 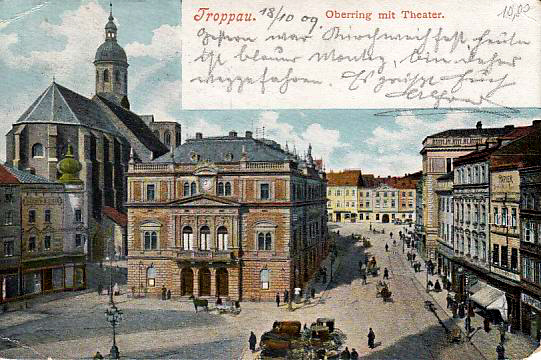 Opened 20 September 1883 with Ferdinand Maria Wendt's "Weihespiel" and Grillparzer's "Der Traum ein Leben". 800 seats. Damaged by a fire on 16 June 1909. Subsequently restored (using interior designs by Ferdinand Maser). 1948 major exterior reconstruction, destroying the neo-Renaissance 1883 façade. 1955-1957 minor reconstructions. Renamed "Divadlo Zdenka Nejedlého" in honour of the Czech musical scholar, journalist and politician, Zdenek Nejedlý (1878-1962). 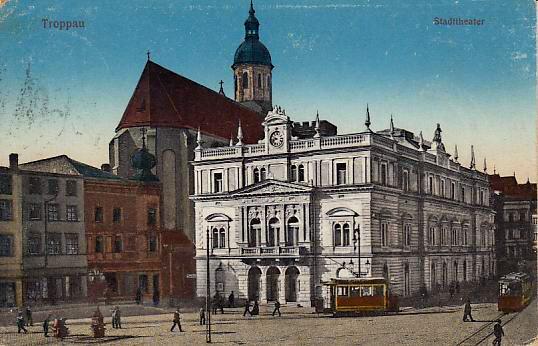 1990-1992 major exterior and interior reconstruction, reconstruction of the original 1882 façade. 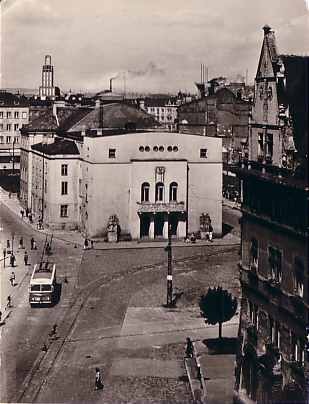 Used for opera and drama performances by the resident "Slezské Divadlo" [Silesian Theatre] companies. 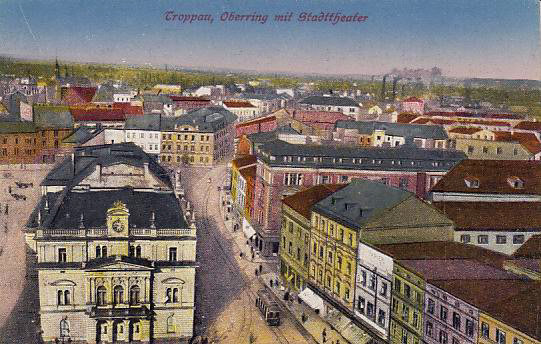 Front Text: "Troppau, Oberring mit Theater"
Front Text: "Troppau, Oberring mit Stadttheater"
Front Text: "Troppau, Stadttheater und Pfarrkirche"
Reverse Text: "Opava, Divadlo Zd. Nejedlého"